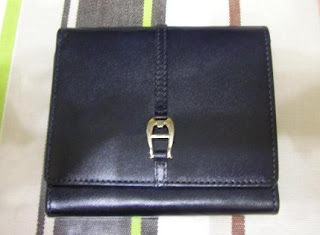 Up for grab is brand new Aigner black leather wallet. measurement of the wallet is.. 4 1/4" x 3 3/4" x 3/4"
and 4 slots of cards. lenny! it's me.. remember? yg borong ur coin purse hari tu! hehehe.. well, i kinda like this wallet.. tp nak tau more info la.. measurement? compartments? for coins? cards? 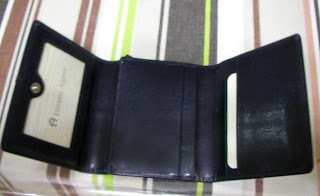 etc.. then closure wallet camne sume.. heh.. update ya nnt? :) thnx! the bride-to-be: i dah email u..